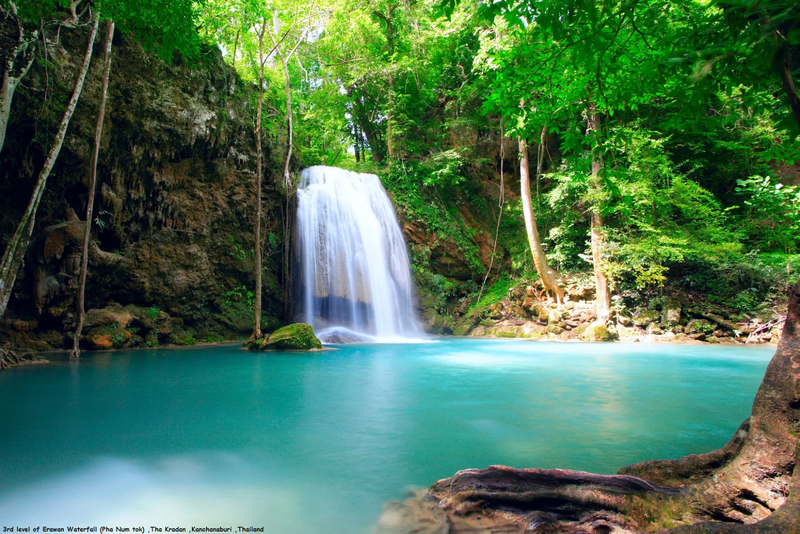 Erawan National Park is a 550 km2 park in western Thailand in the Tenasserim Hills of Kanchanaburi Province, Amphoe Si Sawatin tambon Tha Kradan. Founded in 1975, it was Thailand's 12th national park. The major attraction of the park is Erawan Falls, a waterfall named after the erawan, the three-headed white elephant of Hindu mythology. The seven-tiered falls are said to resemble the erawan. This is 3rd level of Erawan Waterfall (Pha Num tok) .This one also had lots of fish swimming in its plunge pool because most of the people chilled out at the second waterfall. However, this one was significantly taller than the first two (possibly 20-25m ) though not nearly as wide.